It's happened, our first piece of homework has come home for our pre-schooler! Gregory goes home with different children each weekend and in his little backpack is a diary to record his adventures. So far we've taken lots of pictures but not filled it in until they're printed out. 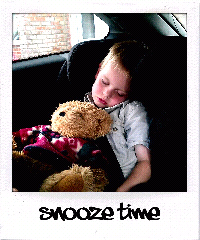 I will share the end of yesterdays trip to Cotswold Wildlife Park as I've been playing with my new roidizer app. I wonder what else we can find for Gregory to do? Hi, loving your latest knits but where can I obtain your scarf leaf pattern from that you made for the magazine comp? Hi Chloe. I thought I'd better pop by and say hello. I'm your Autumn Blogswap partner and I have to apologize for not getting in touch sooner!